It’s the one thing that is drilled into every parent with a child of school age – label everything with your child’s name. Now, with that said, click on through for our guide on where to find a selection of awesome name labels! 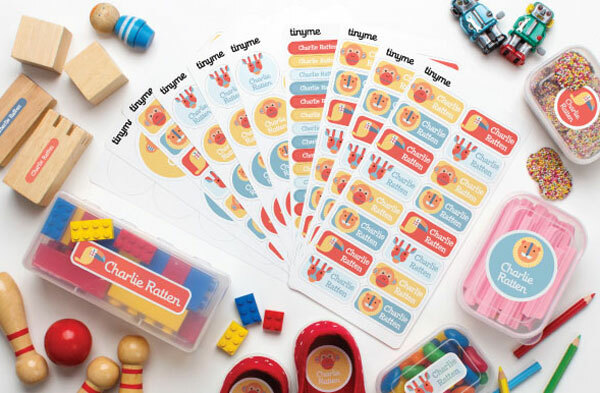 Bright Star Kids have a wonderful selection of easy stick on labels, but we love the value for money they offer with their School Labels Value Kit. For just $39.95 you get a staggering 175 labels to cover everything from exercise books to pencils and even shoes! Ordering is easy – just fill in your child’s name, pick your colour, preferred font and an icon picture, and you’re done. 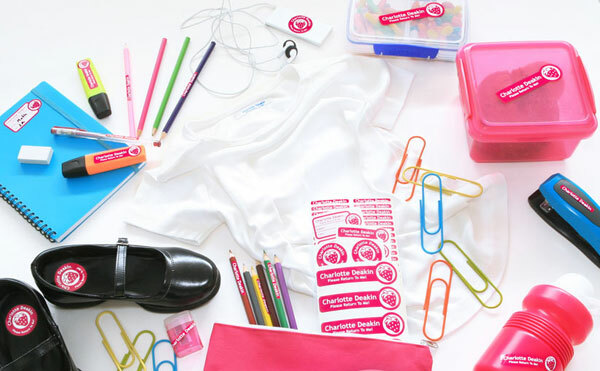 Head on over to Bright Star Kids to order now (and beat the back to school rush!). Those who prefer something that can’t be potentially peeled off, Stamptastic are simply fantastic. The Stamptastic Stamp Set is as easy as, well, stamping – your child’s name is made into a clear rubber stamp attached to a clear mount and you can purchase the small ink pad separately. It’s so easy, the kids can do it themselves for most things. Stamptastic are from the UK, but their ordering and shipping time is remarkably efficient – stamps are priced £8 each and the ink pad will set you back a small £10. For little works of vinyl art, you can’t look past the Personalised Labels from Tiny Me. 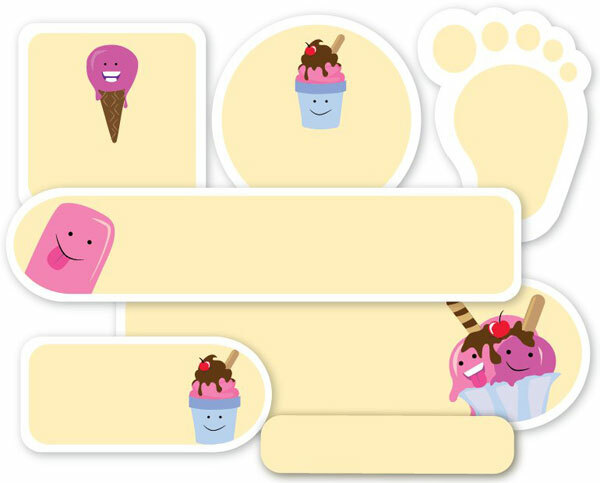 Tiny Me make it incredibly easy to order exactly what you want – be it vinyl labels, iron on clothing labels, or a mixture of both in their value packs. You can choose from a huge selection of colours, designs and themes – there’s definitely something to suit everyone. Value packs are priced from $29.95 from Tiny Me. Stuck On You have awesome deals for those heading back to the classroom with their personalised Vinyl Label range. Label everything and anything with the cute classic range with beautifully bold colours and fun fonts or go the extra mile with the superb designer range. Stuck On You labels can withstand both the dishwasher and microwave and are priced from $19.95. Value packs are also available, which give terrific bang for your buck, prices start at $24.95 from Stuck On You. Hippo Blue Mega Name Labels Pack is indeed mega with an incredible 222 labels included for just $29.70! The Mega Name Labels Pack includes standard, large and jumbo sized vinyl name labels in addition to iron on clothing labels and shoe labels for sticking inside your little (or big) one’s shoes. Head straight to Hippo Blue for some sensational label sets to be delivered before the start of school bell rings. 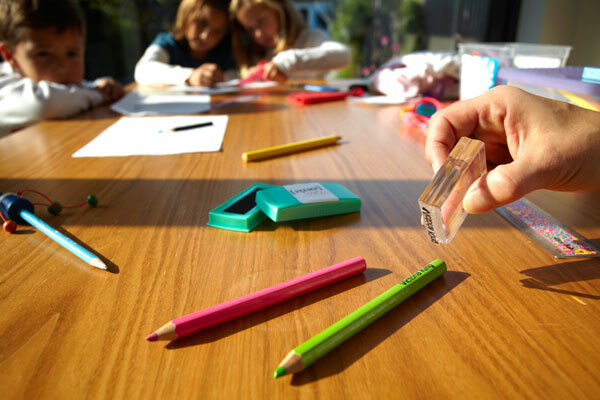 Identikid have those pesky pencils covered, literally, with their Pencil Labels – making naming those millions of pencils and Textas a breeze! Nab yourself a set of sixty pencil labels for just $15, saving both time and your sanity. 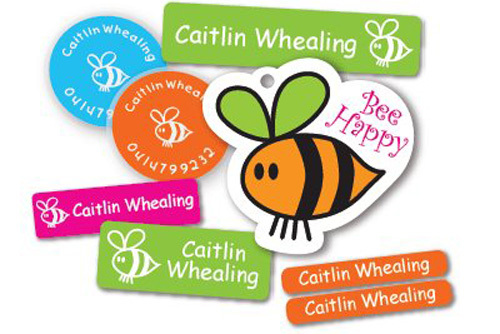 Identikid also have a bounty of super cute bag tags and personalised name labels on offer. Shop for them all at Identikid. We hope this guide provides you with a great start for labeling all and sundry as it heads out the door. Stay tuned for our bags and backpacks guide coming tomorrow.